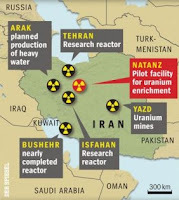 The Iranian regime’s current actions over their nuclear capacity are certainly not very helpful. On this most of the world agrees, however, let’s not let that fact blind us to some other aspects of the current situation. First, we have the West’s hypocrisy. The hypocrisy that says we can have nuclear weapons but no one else can. Obama expressly cited non-proliferation when he condemned the Iranian regime. Well, I think he might have to take a little more action on that himself before he starts pulling on his hiking boots for that journey up the moral high ground. Token gestures towards a nuclear free world, like Brown’s idea to reduce our nuclear fleet from four to three submarines are thrown into sharp perspective when we discover that this does not reduce the number of missiles we own, just the number of craft they are to be launched from. We get the same level of genocide but with savings to the public purse - that's one of those good news bad news things isn't it? The sky would not fall in if the UK, for example, was to scrap its nuclear weapons. Plenty of nations are able to play their part on the world stage without the ability to obliterate millions. However, if the UK did pursue unilateral disarmament it would be the biggest step towards world wide nuclear disarmament the world has ever seen. Brown's got until May to get that started, what are the chances do you think? The Iranians (and others) would find it far harder to justify building their potential nuke building capacity in the context of other nations disarming. Instead we surround them with war and openly call for the overthrow of the regime by foul means or fetid. That’s not helpful either. Second, the West has been teaching rogue nations for the last couple of decades that the one way to ensure you don’t get invaded is to have nukes. It might not be an incredible surprise then if some of these 'rogue nations' start thinking that some of their nation’s resources need to be diverted away from corruption, torture equipment and hospitals into developing actually existing weapons of mass destruction. Third, it is of course great to hear our foreign secretary, David Miliband, say that he is 100% committed to a diplomatic solution. I welcome that, but the evasions and fudging we get when he is asked about military intervention is completely counter-productive. Britain is currently responsible for civil wars in two of Iran’s neighbours (Iraq and Afghanistan) and has somewhat of a record of being willing to use force it’s when necessary, and when it’s not. No one needs convincing that the UK and the US are up for it when it comes to an international bundle, what some of us do need convincing of is whether the tried and tested methods of belligerence, violence and sanctions actually achieve their stated aims. While we hear news of tougher sanctions, Israel demanding a military strike and the possibilities of wider military action in the future (and for the record I should say I don’t think it’s going to come to that right now) what we don’t hear is how on Earth this is going to help the situation. Surely our experience is that it will make both the circumstances we’re trying to address more intractable and have far wider implications across the globe. That’s without considering the fact that sanctions will indisputably have a terrible impact on the lives of ordinary people while actually consolidating the hold on power of the current regime. I don’t want that. You don’t want that. Let’s not go there. Yes there is a great deal of hypocrisy in the West, but not necessarily in the way that you argue it. For years concerned individuals have been arguing that the Iranian theocracy was lying about their nuclear programme, yet these concerns were dismissed. For years it has been argued that you don't need sophisticated uranium enrichment technology for a domestic nuclear energy programme, yet these arguments were ignored. Given the many years that the US and the EU has been trying to cajole and persuade the Iranian theocracy to come clean on their nuclear intentions, without any notable success, it is not surprising that many countries and people in the Middle East are becoming increasingly nervous. The Iranian state's quest for nuclear supremacy in the Middle East, as it seems to be seen locally, is making hitherto non-nuclear states think about acquiring nuclear technology. So all in all unless we bear in mind the context of previous events in these discussions and the subterfuge indulged in by the Iranian ruling classes then it would be hard to understand why people in the Middle East are notably nervous. Until their nerves are settled it plays straight into the right-wing militaristic camp and those wanting the spread of nuclear technology, and the sooner that political activists and others in the West understand that the better. All of this context is important. I was shocked, having not really thought about it before, that it's a major event reducing 4 to 3. Presumably this was just a token gesture to use against Iran to further our own interests. Despicable. Hardly "a token gesture to use against Iran"
Under the NPT Iran is required to make a *full* discourse of *all* nuclear installations and related matters, they didn't. It was their choice, not too, they are not children, the Iran leadership made a calculated choice, they were wrong. Now they are on the back foot. Jim, you've missed out the small matter of what is now the world's fourth largest nuclear weapons power: Israel. That's the issue from which any talks with Iran should start - hence the concern of the mainstream narrative to not mention it at all. "A friend of mine in MI6 told me earlier this year that for the first time, the Israeli nuclear arsenal is now bigger than the British nuclear arsenal. Plainly that is of no concern to Gordon Brown, because while he exhibited righteous indignation today at Iran's attempts to acquire a nuclear weapon, Israel's large and expanding nuclear arsenal was not mentioned at all. The potential to make a bomb in a few years should bring sanctions; the possession of an illegal arsenal of 162 warheads (in February - probably 165 by now) should not even rate a mention. New Labour have of course been providing heavy water and nuclear components to Israel, with a false paper trail through Norway." "On the Today programme this morning, I was pleased to hear John Humphrys ask David Miliband, quite bluntly, why it was a problem for Iran to be purifying uranium but not a problem for Israel to have (supposably) scores of fully militarised nuclear warheads. Miliband replied 'It's a problem because Iran has signed the Non Proliferation Pact, and Israel has not'. And then, believe it or not, they went on with the interview for all the world as if he had answered the question." Iran wants to destroy Israel (search for yourself, don't ask for quotes - they exist and are easily found). They follow a retarded version of Islam that advocates stoning, amputation, and execution of homosexuals. Ahmadinejad denies the holocaust. He's a very dangerous man. I fully support Israel in their desire to see a non-nuclear Iran. I also hope the Iranian people overthrow their odious 'government'. We should be supporting them in this. "Iran has fired one of the longest-range missiles in its arsenal as part of testing it began ahead of a confrontation with foreign powers over a previously undisclosed secret nuclear facility later this week. Earlier today the Revolutionary Guard is reported to have successfully launched the Shahab-3 missile, which is capable of carrying a nuclear warhead and has a range of up to 1,200 miles – which would put Israel, most Arab states and parts of Europe, including much of Turkey, within its range."